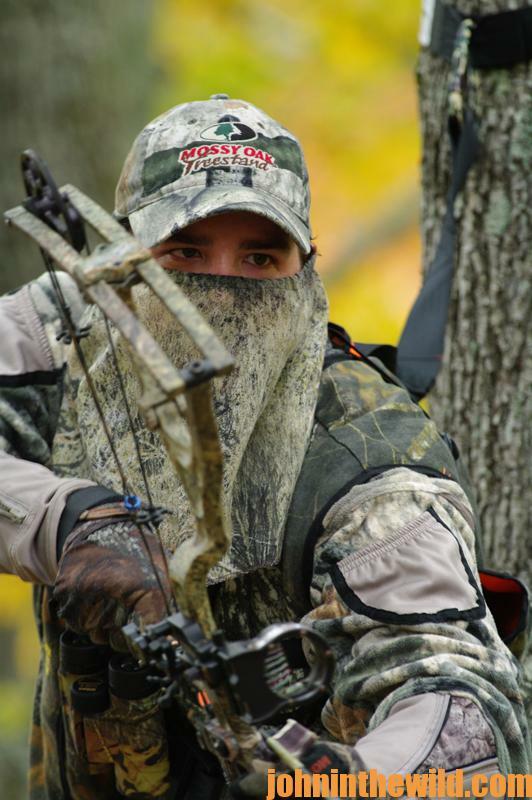 What’s Jacob Lamar’s Iron Man Tactic for Hunting Deer? My brother, Adam, and I were looking for a different challenge after hunting public lands in Alabama and spending quite a few years hunting public land in Illinois in the Shawnee National Forest. So, in 2015, Adam and I with four of our friends decided to hunt public land in Kentucky for several reasons. 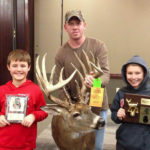 We had read about and heard about the trophy bucks Kentucky had been producing. Kentucky was also a shorter drive from Athens, Alabama, my home, than to Illinois, and the out-of-state deer license was less expensive in Kentucky. 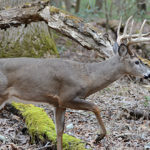 During the summer of 2015, our original plan was to check out two or three public hunting areas, hoping to find older-age-class bucks for the opening day of Kentucky’s archery season in early September. During the spring and summer, we studied topographical maps and aerial photos from Goggle Earth (https://www.google.com/earth/) of the Land Between the Lakes (LBL) property in Kentucky. Each member of our six-man hunting party had certain places to check out on each one of the three public hunting areas we planned to scout. On our first scouting trip in July, I found a long soybean field deep in the woods on LBL, and a smaller soybean field right behind the big field. I liked this spot, because the big soybean field was about 2 miles from an access road, and the smaller soybean field was behind the big field. I felt certain that most hunters wouldn’t be willing to walk that far to get to either one of these soybean fields, because there were a lot of agricultural fields much easier to reach on LBL lands. When we first arrived at LBL, we spent all morning just driving through the property. We decided it was much larger than we ever had imagined. 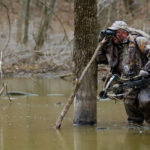 Everyone in the group had chosen different places they wanted to hunt on LBL. On that first scouting trip, we located three different bachelor groups of bucks. The group that we found on the little soybean field behind the long soybean field that I was serious about scouting was phenomenal. We planned to stay well away from the soybean field and just glass the agriculture with our binoculars. Our group liked to scout together, and Adam who was taller than the other five of us, was out in front. 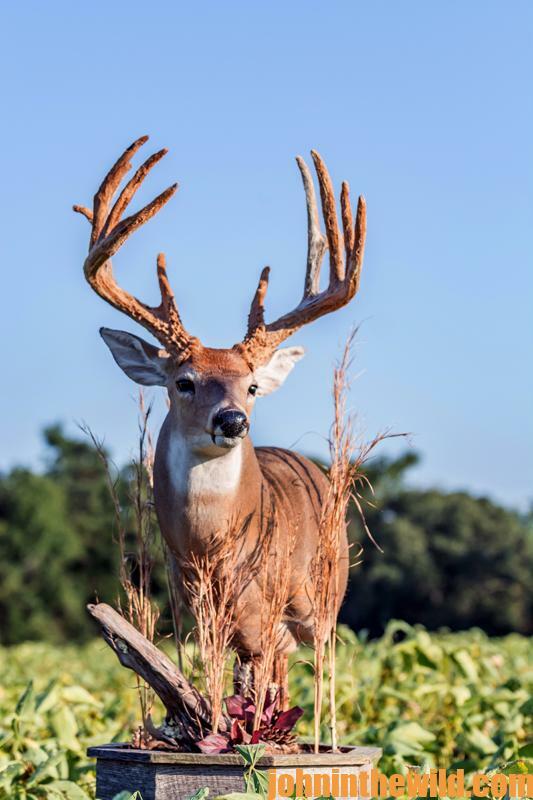 He stopped quickly, turned around and whispered, “A buck that will score 170 and five other bucks are out in that little soybean field.” I knew that neither Adam nor I ever had seen a buck that would score 170, except on television. As we moved up to where Adam was, we could see five bucks. I estimated two of the bucks would score in the 130s, and another one would score in the mid 140s. There were some smaller bucks, but I didn’t see any buck that I thought would come close to scoring 170 inches. We kept watching those bucks, but we didn’t see the big buck until the wind shifted. Then one of the bucks smelled us, and the bucks started moving out of the field. The big buck had been standing behind some brush, so we hadn’t seen him. 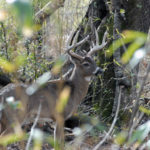 When he walked out into the field, we knew that Adam was telling the truth about the big buck. Adam and I decided to come back the next day and put our trail cameras close to where we had seen the bucks leave the soybean field and at several other locations around the soybean field. Since I had found the spot where we had seen the big buck, Adam decided that he and I would continue to scout this area and check our trail cameras. On opening day of bow season, we’d make the hunt for the big buck. The other four hunters with us had two more groups of bachelor bucks spotted that had older-age-class bucks that they wanted to hunt. 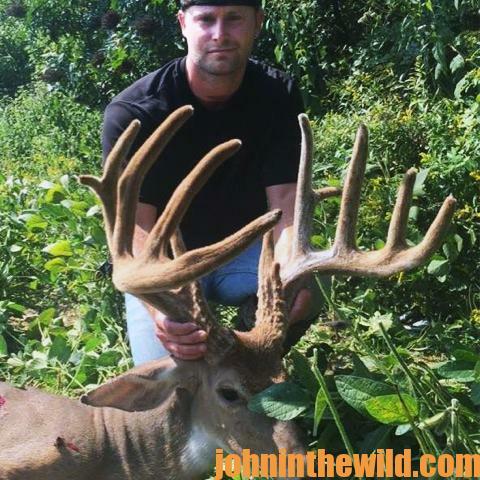 One of the bachelor groups had a buck that would score 150 or more. As opening day of the season drew closer, we decided not to hunt the areas we had found until late in the afternoon, because that was when we had seen the deer feeding on the soybean fields. On opening day at 11:00 am, Adam and I parked my truck and sat in the truck until about 2:00 pm. If anyone else came to that location, we planned to get out of the truck with our bows and start heading into the woods. The first afternoon of the hunt, we saw one buck that we identified as part of the bachelor group coming down toward the soybean field just before dark. But instead of going straight to the soybean field, he went behind us and got a nose full of our human odor. However, the buck wasn’t terrified. He just slowly moved away from us back into the woods. At dark, we could hear other deer coming down the trail. We assumed they were the other five bucks that were part of the bachelor group, because we never saw or got trail-camera pictures of any does or yearlings feeding in this little soybean field. We listened as the bucks walked and fed farther out into the soybean field. Then slowly and quietly we came out of our stands, backed out of the woods and took the long way back to our truck. Our plan on the first afternoon hunt was for Adam to have his video camera with him. Then if the big buck came into the soybean field, he could video me taking the big buck. 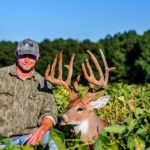 But the next morning, September 5, 2015, we decided that Adam would sit in the stand where I had sat the evening before, and I would move my stand to get closer to the trail that we’d heard the bucks using to go into the soybean field after dark. With only about 45 minutes of daylight left in legal shooting time, the big buck came in and stopped only 20 yards from my stand. To get a shot, I had to stoop down in an awkward position. I loosed the arrow and saw it hit a little far back from where I was aiming. The buck kicked up, jumped twice and was gone. I stayed in my stand. 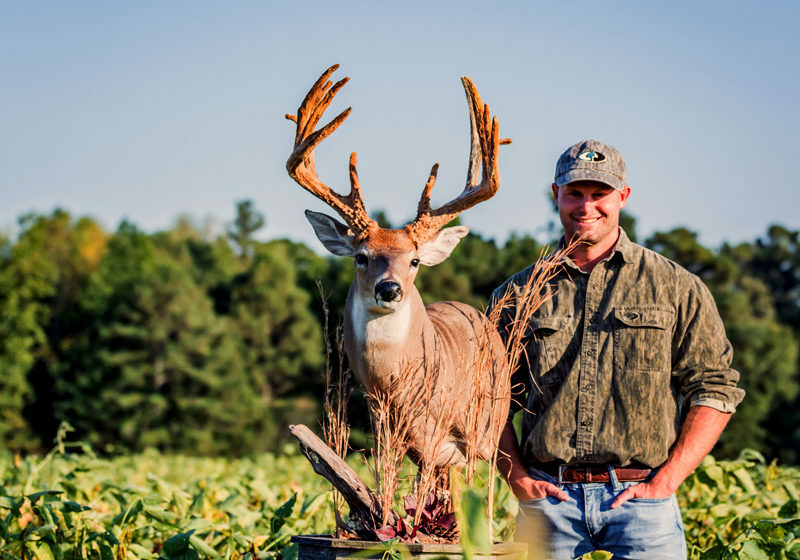 We found Adam’s buck- an 8-pointer that scored 131 inches – bright and early the next morning. We went to look for my deer, and he’d only gone about 40 yards. We dragged both deer out of the woods and headed south for Paul’s Taxidermy Shop in Rogersville, Ala., to get the deer caped and in the cooler to be mounted. My buck had a composite score of 179 and an official Buckmaster score of 163. This Kentucky buck was my buck of a lifetime.